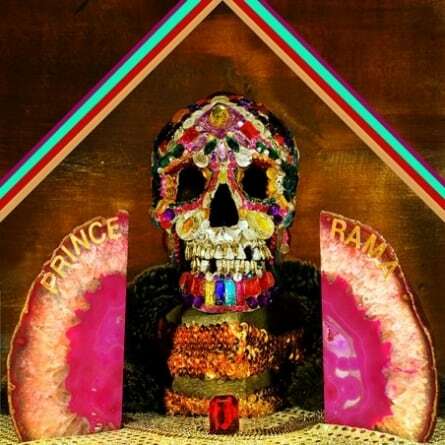 Prince Rama’s official bio states that the band consists of two sisters and a male friend who met while growing up on a Hare Krishna farm in Florida, with an accompanying photo of three crunchy-looking individuals striking yogic poses in the desert. Though that could seem like some kind of ploy to add an extra dimension of authenticity and interest to their otherworldly, spiritual music (see also: Jack and Meg White being siblings; ? from ? and the Mysterians being from space – though on second thought, that one might actually be true) they’ve discussed it freely in various interviews, leading me to believe it’s the real deal. And, once you get a load of Shadow Temple, you’ll understand why I was skeptical as to these kids being legit. WARNING: you will not sing along to Shadow Temple in your car. You won’t turn to it for helpful breakup songs. You won’t turn it on to get your friends pumped while you pregame before going out at night. You probably won’t even be able to pronounce half the song titles, let alone decipher what they mean. If these things are vital to you in a new record, turn back now. Though, when put like that, Shadow Temple sounds like it would be a horribly dull, pretentious record. In actuality, nothing could be further from the truth. Sure, it’s not a party record, but it is deeply, darkly beautiful and compelling. This isn’t some kind of psychedelic throwback album, but more like a natural continuation of the heyday of psychedelic and world music. Shadow Temple feels less like an album and more like a document of a beautiful ritual, where lyrics are replaced with chants and thunder and lightning theatrics (“Storm Worship”). Album closer “Raghupati” is a shimmering, celebratory blast of cosmic energy that leaves you feeling like you’ve been sucked through creation and come out the other side. Sometimes it can sound like a drum circle, but it’s a drum circle you’d actually be into. The whole hippie-dippy-spiritual-eastern-influences thing has been done to death at this point (hell, it was done to death by the 60s), but Prince Rama manages to make it sound new and interesting and, yes, authentic. Even their use of synths and laser effects feel fresh and organic, which is no small feat. What it’s about isn’t important. Lead singer Takara Larson’s vocals are buried deep in the swirling atmosphere, and certainly don’t propel the songs forward. (In fact, most of the songs are defined by their pounding, drum-based patterns.) And her vocal calisthenics, while gorgeous, don’t give much insight when roaring mantras such as “Om Namo Shivaya” out into the universe. But it’s not alienating; instead Shadow Temple feels deeply personal. It was personal for the band when they recorded it, and it will be personal for anyone who listens to it. In a world where hipster dofuses misappropriate various aspects of culture to their own benefit, Prince Rama has the proverbial “skills to pay the bills” and the intelligence to make psychedelic music interesting again. As easy as it would be to write them off as candidates for providing the soundtrack for a laser show, Shadow Temple really is a shimmering jewel of a record that leads the listener of their own spiritual journey, whatever that might be. This author has not added a biography. Meanwhile Ashley Thiry has contributed 19 posts. Click here	to view them.